Long story but here is the short version: a friend of mine called me up asking help with his 2006 ninja 250R, that has been parked for over 4 years. He said he just need it out of the complex apartment, since the management is threatening him on towing the bike. So I got there and took a look at the bike, to find it pretty rough as it was standing there at the back of the property, and the only thing I noticed missing was the windshield. I took it to my friend's warehouse and started cleaning it up and I'm very impressed with the bike. The gas tank is rusted and will need restoration. The question here is... is it worth it? Should I just go ahead and make a Cafe Racer with it? How much is worth it after I get it in riding condition? Does anyone here has parts for it? there was a member here who cafe'd a ninja and then tried to sell it. the bike was on the market for a very long time. i dont think it would be worth the trouble. if you just get it running and put a windshield on it, you could triple your investment. people are about to be looking for first bikes with their tax refunds. This is very true! It's hard selling them as cafe racers or street fighters, i've tried with a couple of 2fiddy's and it's just not worth it. I have an entire Ex500(most of the parts are interchangeable) sitting in a bucket, if you might be interested in some parts shoot me a PM. Tank is bad! If it was me I'd just get it going, clean up and sell it. Looks like it's in pretty good shape right there. I know it's not going to be worth a whole lot to sell but it's fun fixing them and seeing them back on the street. Thanks! I may need the rear break pedal if you have it. I think you are correct. I just got done ordering the Windshield, gas cap, carbs rebuilt kit. I'll work on restoring the tank this weekend. 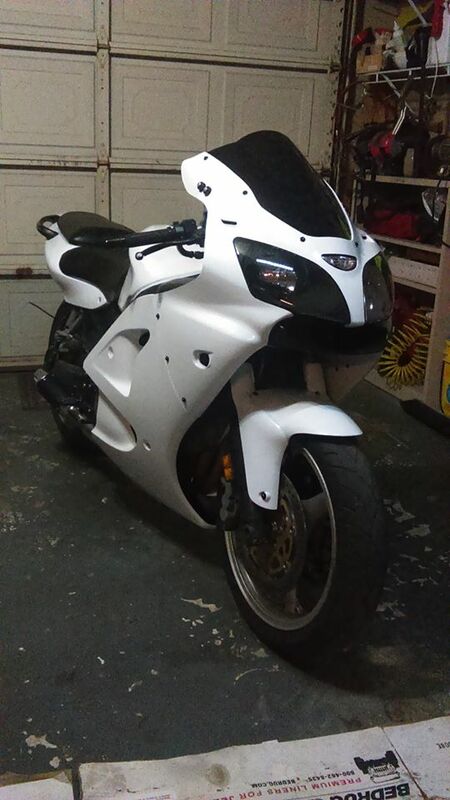 I'm going to try to keep on the low budget to get it in safe riding condition and sale it... who knows, maybe someone will be interested as their first bike for about $1000? If it's anything like my GSXR was after sitting for years, it's likely not the lock mechanism that's messed up but the rubber gasket basically gluing the cap shut. I used the key to retract the lock and gently used a flat blade screwdriver and rag to pry it open without damaging the surrounding. 1000 if very clean. 800 average. 1200 to a sucker. Easy to cafe it out. Steel frame easy to weld. but at the end of the day just not a very fun bike to ride. Strange tire sizes too. I'd say $500 should finish off the project parts and mods. I built this for around $500 icluding the donor bike. Took 2 or 3 days with grinder, welder, amazon, ebay. Crazy...I picked up my 06 Ninja....for the same deal/price. You still got it? I do but unfortunately, I've been busy at work and closing on a house I could not get anything done yet.